Flight time 12 HRS FROM LONDON. 2 HRS 55 MINS FROM NYC. Inspired by the frontier spirit of Bulleit Frontier Whiskey – this exclusive new itinerary will see you gain a truly insider perspective of Kentucky in a way only Black Tomato knows how to provide. Famous for sporting greatness, rural cavernous beauty and a rich bourbon whiskey culture, Kentucky has a wealth of experiences to discover, and this is how we’ll acquaint you with the Bluegrass State. We’ll take you straight to historic downtown Louisville and to your glamorous lodgings, The Brown Hotel. This unique building, with each suite individually designed, seamlessly blends old world opulence with new world comfort. Take a stroll up to Proof on Main for lunch and see what all the fuss is about before wandering down to NuLu, the trendiest of shopping districts complete with local art galleries, bluegrass music floating through the air and local, artisan produce to graze on. Wake up slowly and have a hearty southern breakfast this morning as we’ve organised something very special for you. We’ll chauffeur you to the airstrip in Louisville for your private bird’s eye view tour of bourbon country by helicopter. 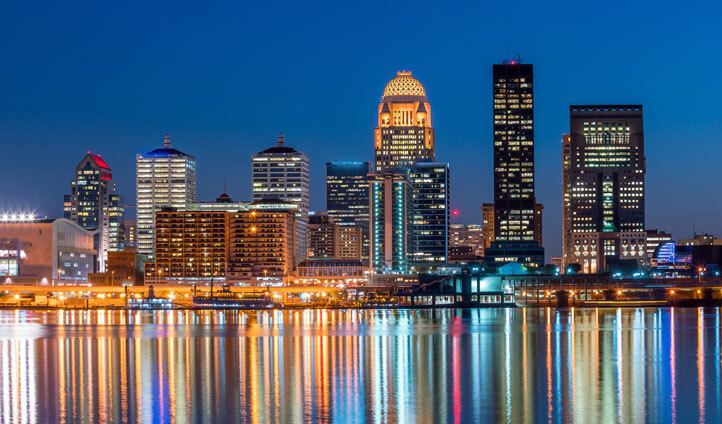 From Louisville to Lexington, look on as the sun glistens off the vines and lush landscapes along with any other landmarks you request before your short exhilarating flight lands. If flying’s not for you however, don’t worry, we’ll organise a vintage American Mustang convertible for you to drive yourself. And, as your feet are staying firmly on the ground, why not spend the morning playing the stunning Valhalla Golf Course beforehand. The Bulleit Frontier Whiskey Experience at Stitzel-Weller will roll out the red carpet after lunch to give Black Tomato guests the ultimate tour behind closed doors. Learn about the brand’s frontier journey and then of course, get involved. Take part in taste-testing, learn about the steps taken to produce the very best flavours, and take home a personally engraved bottle with you, so you can look back on the experience for years to come. After sipping various whiskies, and having worked up an appetite, it’s time to wave goodbye to the distillery as you head off-site to your private BBQ experience. Run by a local pit-master; you’ll learn all about their smoking and grilling techniques as you dine on delicious, authentic fare. Had your fill? Then it’s off to Lexington where you’ll check into the ultra-chic 21C Museum Hotel. Get some good rest and wake with a clear head because you have yet another energetic day to come. (or ‘clay pigeon’ to us Englishmen) shooting at the exclusive Elk Hunt Club where you can see how many you can satisfyingly shatter in mid-air. By the time you fly home, you’ll be a verified Kentuckian. Black Tomato is a UK and US based award-winning, luxury, bespoke travel company that delivers imaginative and cutting-edge travel experiences around the world. Black Tomato is not licensed to sell or distribute alcohol – any and all whiskies must be purchased at a licensed retail location.